RTAs – Rebuildable Tank Atomizers – bridge the gap between the customizability and exceptional performance offered by rebuildable dripping atomizers and the convenience of tank systems. If you’re looking for a top-quality vaping experience that doesn’t require you to keep a constant supply of pre-made coils, finding the best RTA on the market is the ideal solution. But how do you choose from the huge selection of RTAs on the market? How do you make sure you’re getting the best rebuildable tank atomizer? If you've been vaping for a while, you'll know the Protank series already. The original and Protank 2 were some of the most widely-loved vape tanks in the industry’s early days, but the series has kept pace with the evolution of the technology pretty well. The Protank 4 is the latest in the series, and it takes the spot of 10th best RTA thanks to a well-designed RBA head which comes as standard with the device. The good news for many vapers is this is a tank that can do it all. You can use it like an ordinary sub ohm tank – with pre-built and easily changeable coils – if you don’t feel comfortable with rebuildable vape tanks, but there is the option to take things to the next level with your own coils too. The Protank 4 features a substantial 5 ml tank capacity, a side-filling design, and comes with pre-made coils suitable for both direct to lung (0.5 ohm ceramic coil) and mouth to lung (1.5 ohm coil) vaping. The RBA head comes with two Clapton coils pre-installed, and all you have to do to set it up out of the box is wick it up. Four holes drilled in the deck make this easy, allowing e-juice to flow from the tank to your wicks’ tips. The deck itself is a little cramped, but the two-post, Velocity-style design makes rebuilding really easy. It performs excellently across all coil types and is well worth considering if you’re looking for the best rebuildable tank system. It costs $28.95. Wotofo’s Sapor RTA is our pick for 9th best rebuildable tank atomizer on the market, thanks to its spacious build deck and top-notch performance in terms of flavor in particular. The tank has a fairly small 2 ml capacity, but the extra deck-space is a big advantage when it comes to rebuilding. The airflow system of the Sapor also draws air in from the top of the device, which is a big help when it comes to reducing leaking from the device. The deck itself is the two-post, Velocity-style design, and there are two big holes in each post so you can easily set up multi-coil builds with a wide range of wire types. The wicking ports are also sizable, which makes it pretty simple to set up without ending up with dry hits or other wicking issues. The Sapor also uses high-quality materials, including a gold-plated 510 connection to ensure great conductivity and PEEK insulators for heat resistance. If you’re a flavor-chaser, this is easily one of the top RTA devices you can pick up, and the $29.95 price tag makes it a fantastic deal for a great RTA. The TFV series of tanks and the Alien mods have really brought Smok back to the forefront of the industry, and the TFV8 takes the 8th spot thanks to its flexibility and its excellent performance as an RTA. Like the Protank 4, the TFV8 also serves as a standard sub ohm tank you can use with pre-built coils, but includes an RBA head as standard so you can use it as a rebuildable atomizer if that’s what you’re looking for. The tank comes with a 0.15 ohm octuple coil and a quad coil of the same resistance for those looking to use pre-built coils, but also comes with an 18 mm diameter RBA deck which has dual Clapton coils ready-built out of the box. It uses the standard two-post Velocity-style layout and has under-coil airflow to maximize both vapor production and flavor from your builds. There are four wicking holes drilled into the deck so setup is pretty simple. The tank capacity is a beastly 6 ml with the pre-built coils but reduces to a still-respectable 5.5 ml with the slightly larger RBA head installed. Throw in the top-filling design, sizable airflow slots and the generally cool look and you have a sub ohm tank turned RTA you can depend on to provide excellent flavor and vapor with every puff. It costs $34.95. The Quad Flex from Aspire is another unique device, but the impressive level of flexibility it offers earns it a spot as the 7th best rebuildable atomizer on the market. When you buy the Quad Flex, you actually get four different atomizers in one. The device consists of an RTA, an RDA (rebuildable dripping atomizer), a bottom-feeding RDA for squonking and the Nautilus X tank. This makes the Quad Flex an option for a huge number of vapers, from people wanting a mouth-to-lung vape with something like the Nautilus to anybody looking for a rebuildable atomizer of any description. The RTA setup on the Quad Flex is more like a Genesis-style atomizer than most modern RTAs, with the deck at the top of the tank rather than encased within it. The build deck still has the two-post design most modern devices do, but there are holes in the deck so you can thread your wicks through and into the tank. You can also set it up as an “auto-dripper,” where it works basically like a dripping atomizer but you tilt the atomizer to apply more e-liquid to the wicks. Of course you can also turn it into an ordinary RDA by unscrewing the deck section and then screwing on the included base section. The tank on the Quad Flex is a little small, at 2 ml, but it’s easy to fill up and the size of the tank doesn’t really cause an issue. The benefits of the tank far outweigh the downsides, and it’s well deserving of a spot as one of the top RTA devices you can pick up. You can pick up the four-in-one atomizer offering for $44.95. The Kayfun series holds a special place in the heart of many vapers. The older Kayfuns were the first RTAs that really performed well and made a comfortable building platform, and the V5 continues in the proud tradition to earn its spot in our list. The V5 comes with the classic Kayfun-style steel tank, but also a glass alternative if you prefer, and both offer a 4 ml capacity so you don’t have to fill up too regularly. The RTA deck is just like that on older versions of the Kayfun, with two screw-topped contact points for your coil positioned either side of a large central airflow hole. The device also features a liquid control ring, which enables you to adjust how quickly e-juice reaches your wick. The adjustable airflow system covers a wide enough range so that the rebuildable atomizer tank works just as well for mouth to lung or direct to lung draws. Everything uses high-quality materials – from the thermally regulated drip tip to the quartz glass and PEEK insulators – and the tank has a top-filling design to maximize ease of use. The Kayfun V5 has a lot going for it, but it’s a definitively high-end device and has a price-tag to match. It costs $119.95 new, and comes with the engraved steel tank, the glass alternative, a bag of spare parts and a manual. The Kylin from Vandy Vape is another very unique device to make our top ten RTA list. The Kylin is a postless RTA, which means the deck design is very different to most RTAs on the market. The deck consists of a raised section with four contact points drilled into it, with four corresponding screws on the edge of the raised platform so you can attach your coils. The airflow are holes positioned so you get air both underneath and from the side of your coils. This makes the tank excellent for both flavor and vapor production. The deck is also plated in 24k gold to improve conductivity. The vape juice capacity of the tank can be changed from 2 ml to 6 ml depending on your preferences, with two glass sections included with the tank as standard and a chimney extension to go with the bigger tank setup. It’s a top-filling design, so it’s all really user-friendly, and the kit comes with hex keys so all you need is wick and wire to start building. It also comes with three different drip tips in different sizes, and combined with the great adjustable airflow system this gives you plenty of options for tailoring your vaping experience to suit your preferences. The Kylin RTA costs $36.95, which is a great deal for one of the most popular RTAs on the market. The Ammit from GeekVape is a lot like the Kylin, with a postless design that really transforms the rebuilding experience and makes it one of the best-rated RTAs on the market. The dual coil version has a 20 mm build deck and a design much like the Kylin’s deck, with four post-holes in the base of the deck and both bottom and side airflow to ensure the performance is excellent. The original only supported single-coil builds, but GeekVape’s upgrade gives it much more flexibility for vapers looking for a rebuildable atomizer tank with more flexibility and the potential to be used in both single and dual coil setups. It comes with a cover which you can use to block up the post-holes and airflow holes for half of the deck and use it as a single-coil RTA. The tank is 3 ml as standard, but comes with everything you need to extend this to 6 ml. As with the Kylin, this is a really useful feature that gives you the choice between a more compact design and a bigger tank, and you can switch from one to the other really easily. It has adjustable airflow slots around the bottom of the tank so you can adjust your draw to suit your preferences, and the top-filling design makes it really easy to fill up. It comes with a wide-bore drip tip as standard, but you also get an adapter so you can use it with ordinary 510 drip tips if you prefer. The Ammit Dual Coil costs $29.99 direct from GeekVape. The Volt 2 from VaporFi snaps up the 3rd spot thanks to great performance and the flexibility to use it as an ordinary sub ohm tank as well as an RTA. The tank comes with 0.5 ohm, 0.15 ohm (Ni200) and 1.5 ohm pre-made atomizer heads as standard, which are all great options for vapers wanting something easy to use that performs really well. However, you can also add an RBA head that transforms the tank into a capable and easy-to-use RTA. The tank for the Volt 2 has a 4 ml capacity, which isn’t the biggest on this list, but is still comfortably big enough for most vapers’ needs. The tank has a top-filling design, and has two airflow slots around the base which you can adjust to suit your preferences. The RBA head has a pretty basic design, with two screw-topped connection points either side of an under-coil airflow hole and the whole thing encased in a chamber about the same size as one of the pre-built coils. It’s very similar to the RBA attachment for the Kanger Subtank. The good news is it’s really easy to build on and set up, and this makes the Volt 2 one of the best rebuildable atomizers for beginners. The tank itself costs $34.99 and you can add the RBA head for an extra $7.99. The Augvape Merlin takes the second spot thanks to its simplicity and flexibility as a building platform in addition to the rebuildable dripping tank atomizer (RDTA) design. Like the Quad Flex, you can set it up to work like a dripping atomizer that’s fed by a tank rather than in the traditional RTA style. The deck sits above a 3.5 ml capacity tank, with a dual-post design where both connect to the same central section. The Merlin has a beautiful design. From the ornate designs of the exterior down to the posts and the self-sealing central fill hole, everything looks excellent and works just as it should. The RDTA style design provides much more deck space above the tank than you’d get with the deck encased in the tank. This makes building much more forgiving and gives you the opportunity to build more complex and high-performance coils. The post-holes are also 4 mm square, so there’s plenty of room for multi-coil builds even with thicker wires or Clapton coils. The Merlin costs $30.95 and comes with spare O-rings, screws and an extra glass section. The OBS Engine is our pick for the best RTA on the market thanks to its combination of a great build deck, excellent performance and huge 5.2 ml side and top-filling tank. The device works like most rebuildable tank atomizers, with a deck surrounded by a chamber on the inside of the tank, and it features a two-post design with two post-holes in each. This makes it really easy to set up multi-coil builds, and anybody with experience with rebuildable atomizers will feel right at home. The wicking channels on the OBS Engine are underneath the deck, with four big holes in the bottom of the deck so you can set your wicks up easily. It also uses a top airflow system, which makes the tank completely leak-free, removing one of the most common issues vapers face with tanks of all types. The Engine has a well-designed airflow system. The top intake pulls air down and right around your coils before combining with your vapor and heading up the central tube. This contributes to the astounding flavor and vapor you get from the OBS Engine. The OBS Engine is available for $29.95, which is a great deal for the best RTA on the market. The build deck of a typical RTA. If you’re wondering “What does RTA stand for?” or “What is an RTA?” the answer is basically the same: it’s a rebuildable tank atomizer. Picking this apart, any atomizer is the thing that turns your e-liquid into an inhalable vapor, and tank refers to the fact that there is a tank that can hold a lot of e-liquid for you to vape throughout the day. In this way, any sub ohm tank is a tank atomizer. The “rebuildable” part is what really explains what RTAs are. A rebuildable atomizer is any atomizer where you wrap your own coil and set it up yourself instead of depending on pre-made coils. You wrap the coil, attach it to two “posts” to complete the circuit and insert a wick before you start vaping. In a rebuildable dripping atomizer (RDA) you apply e-liquid directly to the wick and use it for a short period of time before applying more. In an RTA, there is a tank to supply e-liquid to the coil without you having to drip regularly. So the answer to “what is an RDA?” is simple: a tank system where you make your own coils to vape with. There are a few main types of RTA, although all of them meet the basic definition described above. Ordinary RTA: Most RTAs are just like sub ohm tanks, except with a deck towards the bottom of the tank, which contains two or more posts to attach your coil and ports so the wicks can absorb liquid from the surrounding tank. Genesis-Style RTA: These RTAs work a lot like ordinary RTAs, except the deck is above the tank and the wicks hang down through the bottom of the deck into it. RDTA: Rebuildable dripping tank atomizers are a lot like genesis-style devices but are designed to be used more like an RDA. The wicks cover the holes and rest on the deck, so you can top up your liquid by simply tilting the tank. Sub Ohm Tanks with RBA Heads: These are devices that can serve as ordinary sub ohm tanks but also have an RBA (rebuildable atomizer) attachment so you can turn them into an RTA if you want to. Rebuildable Atomizers for Beginners: Which are the Best RTAs for Newer Vapers? If you haven’t built your own coils before, the world of rebuildable atomizers might seem a little daunting. It means changing the screw-in, screw-out simplicity of pre-made coils and replacing it with the much more technical process of wrapping your own coil and setting it up to vape yourself. Rebuildable tank atomizers are a little more complicated than ordinary tanks, and generally rebuildable atomizers are only recommended for more experienced vapers. 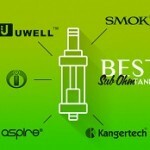 However, there are some factors that can help you find the best rebuildable atomizers for beginners. How many posts? Generally speaking, most rebuildable tank atomizers these days have two-post layouts. The majority of the contenders for the title of best RTA listed above use this approach. Older designs would either have screws to trap your wire under, or would have three posts so you couldn’t make multi-coil builds without sharing the center post. Two-post, Velocity-style deck RTAs make this much simpler, with big and easily opened holes in the posts and being perfectly setup for multi-coil builds. If you’re new to RTAs, choose one with a two-post deck or a postless deck. How much deck space? Another major factor affecting how difficult RTAs are to use is how much space you have to put together your build. Bigger decks are generally easier to build on, so the bigger the deck, the better the RTA is for beginners. Genesis-style RTAs or RDTAs tend to have the biggest decks, so they’re worth considering if you’re new to rebuilding. How do you wick it? Wicking is one of the most important parts of setting up an RTA, but also one of the most challenging aspects. Most RTAs have wicking channels, which you insert the tips of your wicks into so they can soak up e-juice. However, some wicking channels are better than others. The best tank-based rebuildable atomizers for beginners will have bigger wicking channels, or a unique approach to make things easier like you’ll find on the OBS Engine. If you’re struggling to find a great RTA for beginners, the best advice is to check out some RTA reviews. Good reviews will give you plenty of detail about how easy the device is to build on and how suitable it is for anybody new to rebuilding. Alternatively, if you’re willing to put a bit of time into learning how to rebuild, it’s really not too difficult, and after a little bit of practice you’ll be able to build comfortably on most RTAs on the market. Check out this more detailed guide if you’re interested in learning more. Things have improved drastically since the early days of RTAs. Back then, companies crammed small build decks into leak-prone tanks that were very fiddly to set up. Now RTAs are much more user-friendly and dependable, and devices like the RTAs listed above work just as well as sub ohm tanks but offer so much more flexibility to tailor their performance to your preferences. If you’re getting sick and tired of paying for packs of pre-built coils, investing in an RTA could change your vaping life for the better.